This is a freshly butchered section of an old contra-flow route between the Ulster Bank buildings on George’s Quay and Busaras. It’s one of the little-known contra-flow routes but that’s no excuse for making it worse. The above photo is of a view towards the Custom House, with Busaras further in the background. The images here are taken at the quay-side of east-end of Custom House. The changes were part of a new contra-flow bus / cycle lane along the north quays from the Custom House / IFSC to the Rosie Hackett Bridge near O’Connell Street. All of the photos focus on different sides of the junction (circled in blue) — please excuse the darkness. The map above (click to view in Google Maps) shows the old contra-flow cycle route (red), the new contra-flow bus/cycle lane (light blue), and the new pedestrian crossing where the two routes meet (purple; and shown to the right in the main photo above, it’s not the main crossing featured in the photos). There’s no markings on the road here to show that there’s a bicycle crossing beside the pedestrian crossing (our carefully crafted arrows added for clarity). 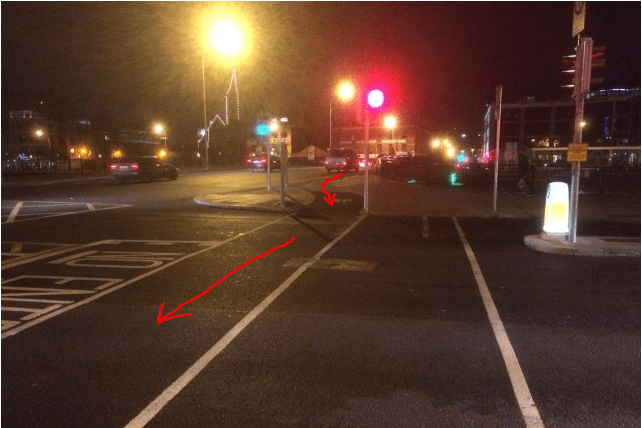 Rather than being a criticism of the designers of the project, this is a criticism of our current cycle-route design and road traffic markings guidance, respectively, by the National Transport Authority and the Department of Transport. Then again, most of the problems we cover on the Irish Cycle Facility of the Week are due to design standards which are too flexible and overall poor mainly because shared footpaths are exemplified so much and there’s a lack of detail on how to design segregation to a decent standard. Following the route (shown with our carefully crafted red lines and arrows) you get directed onto a footpath. The road-level but high kerb segregated contra-flow cycle path starts at the end of the red arrow to the left of the image. The lack of clarity of where to go after the bicycle crossing was always an issue on this route, but the solution chosen of mixing cycling and walking on a footpath with no signs of shared use signs or markings isn’t exactly the best solution for any road user. 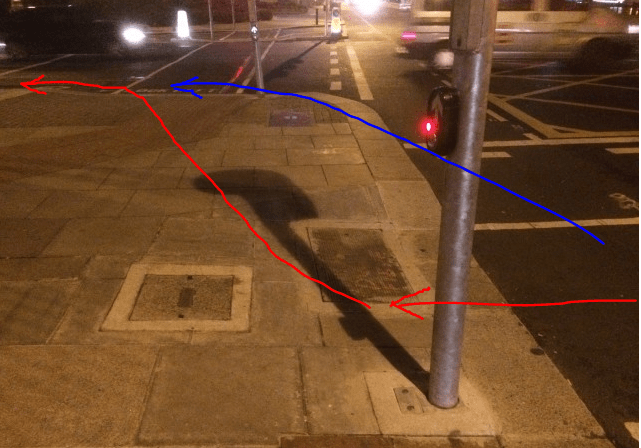 A partly protected cycle lane could have followed the blue line shown above. Again: This is as much a design standards issue as a route design issue. We’re waiting for the designs of the Liffey quays cycling and walking route, and our fear is that the designers will opt for similarly poor designs — we hope our fears are unfounded. It has to be said that the extra width of the on-road cycle lanes along here are nicer than before (we think that the burning off marks of the old lane can be seen inside the cycle lane line). They seem to be getting very economical with putting Bicycle signs on all of the Bicycle Lanes and tracks. There is just the bare amount on any Cycle lanes anywhere.Those signs that have worn away ,they are not in a hurry to repaint them. @John Power Indeed, and yet at the (horrible) junctions around Christ Church the yellow boxes are so thickly painted they could jolt you off your bike. 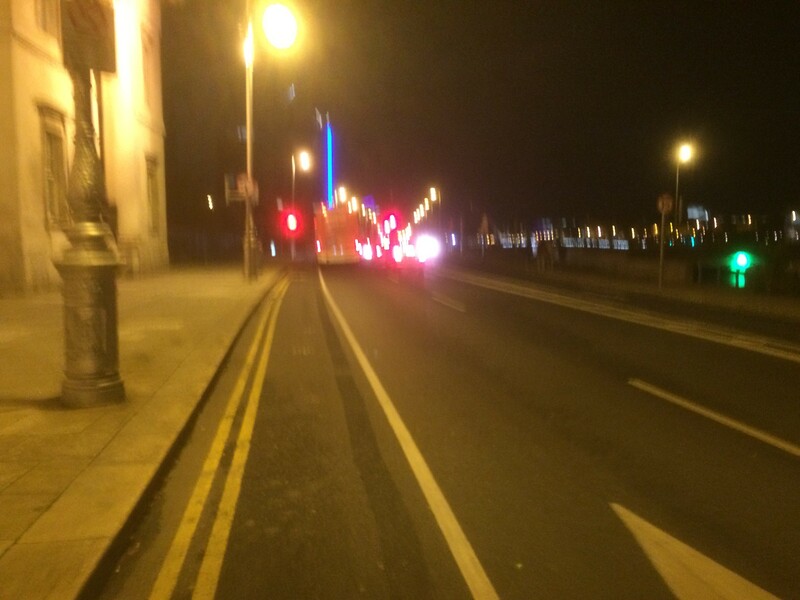 As regards the docklands, many of the newish cycle lanes there are a total joke. Sudden transitions, shared space, lack of signage, general discontinuity of routes, it’s all there. The area is a case study in how to get it wrong.